It's off to prom, but first, it's customary to go to a friend's house (whoever has the biggest, greenest lawn) and take customary prom pictures. You know the ones we're talking about. Everyone lines up next to their dates, corsages and boutonnieres are exchanged, before everyone's moms and dads snap pictures on their smartphones. Then it's off to prom where dancing, snacking (on brains), and partying will take place, not to mention, the crowning of the prom queen. You're dying to win, even though you're already dead (well, undead), but zombie teens have dreams too and you're determined to win the crown. And if you don't? No biggie, you'll just eat the girl who does. The girl's zombie queen costume transforms the living into the undead. It also changes a regular student into high-school royalty. Sit down with your date to enjoy a plate of flesh strips (they taste similar to chicken strips) with your date, then flaunt those "Thriller" dance moves on the dancefloor with all your friends and don't forget to show off that crown. You earned it! 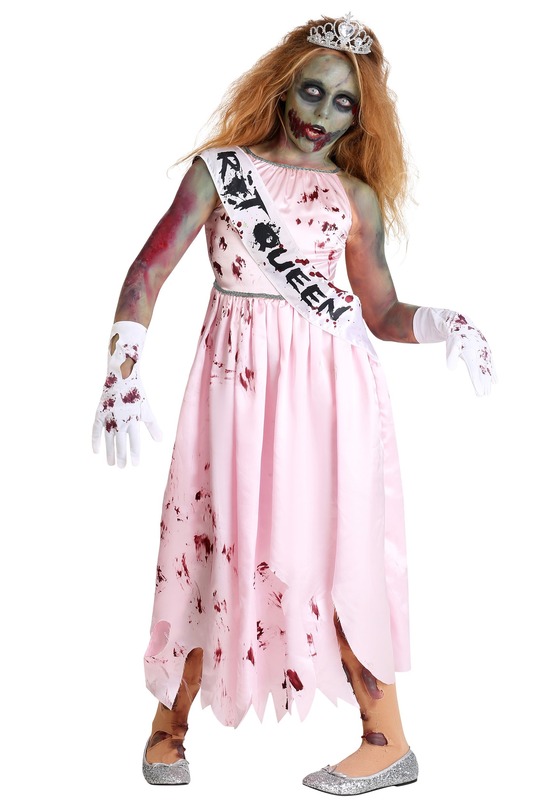 The girl's zombie queen costume is a Made by Us design, meaning it's created by our talented design team and formed from high-quality fabric and materials. The tank dress is a girly shade of pink with a silver, braided band around the waist and a matching one around the neck. The dress is tattered, features holes, blood spatter, and a jagged hemline. A rhinestone-encrusted crown, a sash reading "rot queen," and a pair of bloody gloves are also included. This is a complete costume with includes but adding a pair of bloody zombie tights will keep exposed legs warm and a zombie makeup kit will create a scarier, undead appearance.